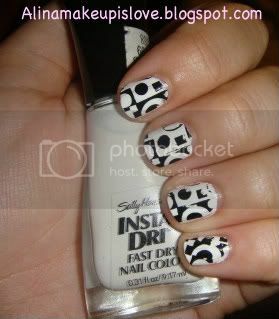 Nail Of The Day: Sally Hansen Insta-Dri in 'Whirlwind White' + Konad! Here is my current nail of the day. Ok, I guess it is safe to say that I am becoming quite obsessed with Sally Hansen's Insta-Dri nail polishes. I feel like I gotta start a collection, ya' know? The other day I realized that I did not own a nice crisp, white nail polish. Immedietley, I went to my local CVS store and knew I could rely on my trusty Sally Hansen Insta-Dri polish. Let me tell you, this color is amazing. I always hear that most white nail polishes can go on streaky, or they can require lots of coats in order to get that white opaque look. But not with this insta-dri polish, no way! I got a beautiful-streak free, no air bubbles, even opaque look with just one coat! I did 2 coats because of habit, but you can definitely get away with one coat of Sally Hansens Whirlwind White ($4.99). Here is a picture of the white polish on my nails, and I decided to add a fun, retro konad image from plate m65. I am not too happy with how the designs came out, but its ok...looks cool. Practice makes perfect! Don't worry, I will get my Konad game up lol. Disclosure: I purchased this nail polish at my local CVS drugstore.